With several men restraining Jack, face-down with their knees firmly implanted into the small of his back, they clasp a new pair of handcuffs around his wrists. Jack’s feet are then shackled to limit his kicking ability. The men yank on the chain connected to his cuffs to bring him to his feet. Jack sneers to hide the jolt of pain that surged through his shoulders and neck from that jerk. It isn’t the worst pain he’s ever felt, but it was enough to remember that those muscles and joints still exist. Despite his desire to cooperate for the moment out of sheer curiosity, his instincts were in high gear examining his captors. If he were to attempt an escape, this is not the opportune time. Even if he overcame all these men, he knew nothing of the facility outside the confines of his cell. He assumes that he’s below ground, but beyond that is speculation. With a shove, Jack is pushed into the hallway. Just then, Jack could taste some blood on his lips. Was it his or the Colonel’s? He wasn’t sure, but Jack wondered how much they would clean up the room before bringing in the next prisoner. A blood-stained room may open the mouths of some prisoners a little easier than not, and a good interrogator uses everything to his advantage. Jack’s mind drifts on this thought briefly as he is lead down the corridor. All the doors to the rooms look exactly alike to Jack. The only difference is the number/letter combinations above them. He could hear moans and groans from behind a few of them – prisoners, no doubt, that have suffered either torture recently, or starvation pains. Or, that have started to lose their minds from the monotony of their daily lives trapped in a dimly lit cell without enough space to take more than a few steps in either direction. Jack is led into another room near the end of the hall. This room is about the same size as the one he just left and just as plain. But there was no table in the center this time – no glass of water to break. He could also see two long chains with cuffs lying on the ground and attached to the walls. After being shoved to the center of the room, the chains were clasped to each of his wrists. Jack’s captors remove the handcuffs, but quickly tug on the chains to stretch his arms out. If it was any harder, his shoulders may have come out of their sockets. The men then rip Jack’s clothes off, which is something that Jack unfortunately has gotten used to over the years. As a powerful stream of water hit his naked body, the recent cuts cause Jack to noticeably wince at the pain. Two men began scrubbing him down with sponges that were attached to long rods. Water, blood, and soot all run down his body and into a drain in the ground underneath his feet. It feels good to be clean for the first time in months, if not a little strange. You get used to your own stench when you’re forced to. The apartment was mostly dark: only a couple of low-watt bulbs allowed Kate to see what she was working on at the table. Even though they invested in thick curtains to block out any light that would come from the apartment, as well as lines of sight coming the opposite direction, they wanted to use as few lights as possible. It was also impossible to see silhouettes of people in the apartment from outside. Kate made sure to check this several times during the first couple of nights that she was there. The Linux-powered computer in front of Kate revealed the map of Moscow with the possible locations for Jack. Only three remain, all based on recent tips. Their resources were limited since they were operating without the aid of the government or any other group. Kate was used to having resources and people at her disposal. She closed her eyes, rolled her head slightly, and sighed. “Why am I here?” she asked herself. The events of the past several months blurred together. She had searched and studied Bauer for years. She understood how he thought and what he would plan. That’s what helped her in London. She figured him out before the others did, and there was a definite connection between them. But none of that knowledge was helpful now. Jack wasn’t hiding voluntarily, he was taken captive – and as far as she knew – he was held against his will. A small flicker of doubt entered her thoughts, though, that maybe Jack staged the capture to go back into hiding. It wouldn’t be beyond him to do that – after all he had faked his own death before. But that was with the help of his friends – Chloe, Tony, and Michelle. His friends that were involved with him this time, however, were searching with her, making that scenario less likely. “Hopefully he was able to find something out,” a woman’s voice came from the other room. “And time,” the woman says, walking into the room. “I’m not giving up,” Chloe interrupted. The faint light revealed her now blonde hair. It had grown just passed her shoulder since coming to Moscow. The dark, Gothic style no longer matches her mood. Although she still has some bitterness against the United States government, it is not as deep as it was before London. Prior to, she had lived in belief that the United States government was responsible for the car accident that killed her husband and son until Adrian Cross revealed the truth…that it was simply a freak accident. Chloe’s thoughts regularly revisited that day when Jack rescued her in London. Even though she knew it was ultimately to save President Heller, the bond and relationship between the two of them had always been deep. “That didn’t sound promising,” Kate states after Chloe hung up the phone. It was a short time, but the men were efficient at grooming Jack in much the same manner as they would a family pet. They hosed him down with a rough lye soap and water. After being dried off, a man had taken a pair of clippers and given Jack a quick haircut – now it was just stubble. Jack’s beard, which had never been shaved since arriving here, was also clipped and shaved with a straight razor. Jack knew he was being prepared for something. The pants put on him were denim, not part of the usual prison uniform he has come accustomed to. A dozen men have their guns drawn on Jack as his handcuffs are removed to put a gray t-shirt on. Jack cooperates, but provides enough resistance to let them know that he hasn’t been completely defeated. His hands again cuffed behind his back. A man walks around Jack, looking him over. He mumbles something to one of the guards and then orders Jack to follow him. Jack doesn’t move until he is pushed with a rifle’s barrel. Barefoot, he is led further down the hall to an awaiting elevator. He is led inside and surrounded by at least a half dozen men, all staring directly at him. Jack’s mind quickly moved through several standard options to overpower these captors. His muscles tensed as he fought the urge to take them down. He keeps reminding himself again that he wants to see who the man in the suit was and what he wants. After short ride, they all exit the elevator. A ray of light blinds Jack for a moment, the first glimpse of sunlight he had seen in months. After his sight returned to normal after a few moments of exposure, jack could see that this corridor was decorated simply and neatly, not barren like his hallway. Russian flags hung on the wall with a few pictures of recent Russian leaders. Jack noticed that former President Suvarov’s picture was not among them. Interesting. One of the guards knocked on the door at the end of a short hallway. After a brief moment, the door is opened and Jack is led inside. “Welcome, Jack.” The man in the suit from the interrogation chamber looks up from behind a large oak desk. The room is about twice the size of the chamber, but is obviously a working office, perhaps of this man – not specifically for interrogation; it was more suited for diplomatic meetings. Bookshelves line the wall, except for one window to Jack’s left. The glass was likely bulletproof and was guarded by iron bars – not an easy escape. Jack doesn’t notice any cameras, but they are probably well hidden. “Have a seat,” the man offers a chair on the opposite side of his desk. Jack doesn’t move or say a word. He just stares at the man, trying to read him. The man stares back, seemingly immune to Jack’s intimidation. With a nod from the man, the guards force Jack down into the chair. Morozov pauses, hoping for a reaction from Jack. Nothing. Jack remains silent, keeping his gaze locked on the man’s eyes. Jack flashes a small half-smile. Maybe it was because he proved that he was still able to take down one of his trained attack dogs, even in this condition. Maybe it was because this man thought the Colonel was “good.” Either way, he needs something to use to his advantage. A simple smile can catch someone off guard, especially in a serious situation. The roads on downtown Moscow are busy, filled with people heading home as the sun starts to go behind the buildings. Inside a plain, brown cargo van, a male driver is joined by a woman that emerges from the back. She pulls her phone out of her pocket, places a small chip on it, and dials a number. As she does, the driver puts the van in gear and pulls out, blending seamlessly into Moscow traffic. She looks to the back of the van, where there are four more men and several computer monitors that line the passenger side of the van. The screens flash with different words and numbers, all in Russian. One of the screens displays a primitive map with a flashing red dot. One of the men is typing into the computer. After a moment, he looked up to see the woman looking. Jack and Morozov can both feel the tension growing in the room. They have simply stared at each other for several minutes, both trying to figure the other person out. Morozov knew Jack’s history and wasn’t surprised by his actions with the Colonel. He had hoped that the Colonel would have been able to control himself better and get Jack’s cooperation himself. But he didn’t, and now the responsibility has fallen to him. Morozov told Jack that their government had been receiving threats from various radical mobs in Russia for the past year. Small attacks have occurred throughout the country, mostly in and around the capital. The most recent intel being received is that a much larger attack was set to target a government building in downtown Moscow later that night. During Morozov’s explanation, Jack had been trying to fidget with the handcuffs. The guards did a better job securing them this time around, so he wasn’t able to slip either of his hands out. His feet were still free, and he had been mentally preparing to use them if necessary. To position himself better, he sat slightly forward in his chair. This would allow him to either jump up or get down easily. Morozov lowers the pistol, but keeps his gaze with Jack. Jack mulls the situation over in his mind. Morozov was better tempered than he first thought, and apparently understands that it takes more than torture and physical threats to motivate people – especially a highly trained soldier like Jack Bauer. Jack could tell that there’s something that Morozov isn’t telling him, probably a lot of somethings. Why did Russia need him specifically? From what Jack can tell, this is a military prison, so all of the prisoners would be trained soldiers of some sort or another. In fact, why not use someone that doesn’t need threats to comply? Jack isn’t in the position to interrogate to get his answers, so he files the thoughts away in his mind. He has to be watchful for a trap. He was tricked before while in China, which led to the death of an undercover agent. It wasn’t even a spoken word – just a glance and a blink. He never forgot the look on that man’s face when they shot him. Kate and Chloe have sat quietly since the phone call, trying to rest their minds. They have been busy day and night, trying to track down all these leads – leads that brought them to Moscow; leads that took them all over the city, from abandoned warehouses to private security firms to government buildings. None of them produced any kind of solid results. If Jack is in Moscow – or ever was anyway – the Russians have hidden him very well. They weren’t even sure if Jack’s kidnapping was officially sanctioned by the Russian government, or if it was a mob job for ransom. For all they knew, Jack was shipped off to Siberia to one of the work camps, or was sent to the White House in little pieces. None of their intel, however, supported either theory. Thankfully. Chloe wished she still had all the resources she used to have through CTU, or even while she worked with Open Cell. Kate was able to tap into some of her contacts from her time in the CIA, but she encountered opposition when they found out the target was Jack Bauer. Even with Jack’s actions in London, not everyone was in love with him. Frustrated, Chloe sighs and stands to go to the kitchen. She needed a drink and maybe something to eat. The kitchen was around the corner from the living room area. There was only a two-burner gas stove, a sink, and refrigerator. The counters were small – definitely not designed for a preparing a big meal. Chloe opens the refrigerator door and grabs a bottle of water. After taking a sip, she reaches for the loaf of bread, takes a slice and pops it into the toaster. She takes another sip of water while waiting. A knock at the door startles Kate. She instinctively grabs her pistol from her side, pointing it at the door. With all she’s been through, paranoia had become more of a trusted ally than a concerning mental condition. She slowly stands up from the couch, the pistol still aimed at the door. Kate remained silent, keeping her eyes and gun trained on the door. After a few long seconds, an explosive blows the door’s locks open. The man kicks the door in, and slowly enters with his gun leading the way. Neither party has said anything nor fired their weapons to this point. They just stared, trying to read each other and the situation. Kate didn’t see anyone else behind the man, but there was no way for her to know for sure. If she fired prematurely and someone else was there, she may end up at a lethal disadvantage. “Who do you think you are?” Kate broke the silence. “That’s not important right now. All you need to know is that I can help you. There’s not much time.” The man remained steady and calm. “I know where you can find Jack Bauer,” the man replies. Just then, Chloe emerges from the kitchen. She has a shotgun pointing at the intruder which was conveniently stored under the kitchen table. She longed for the days when she could simply work at a computer without having to handle all the damn firearms. But this is where her life has taken her, and she has become at least a little comfortable with handling weapons. “How do you know about so much about us?” Chloe asked, cocking the gun for added emphasis. “Like I said, I can help you.” The man releases his finger from the trigger and raised his hands slightly. Behind the man, a dark figure appears. The lights in the hallway are terrible, so this person’s face was difficult to see. Kate and Chloe both wondered if this was a friend of this man, or if it was their ally. The answer came when the figure raised his arms up and came down on the back of the man’s neck. The man fell to the ground, dropping his gun. The figure steps into the apartment and bent down to check the man. The figure looked up, revealing his face. “He’s right there.” Kate said dryly. The dark alley had a single light above a loading dock. The brown van backs up to the dock, and the occupants exited through the back, each person carrying various supplies into the building. The driver exits last, closes the van’s doors, and scans the area for signs of movement. As they close the overhead door to the dock, a security guard comes from around the corner. Immediately, the driver draws his gun on the guard. Several of the others follow suit. This was supposed to be a secure location. The others slowly dropped their guard and began following the man down a series of hallways. They soon came to a room where a dozen other men were waiting. “We’re ready, Mr. Lebedev,” said the driver. The woman pulls the flip phone from her coat pocket and hands it to Lebedev. Fantastic job – Can’t wait til the next installment. Gripping!! Totally hooked and can’t wait for the next instalment already. Thanks!! Very Good job! I know that The Russian need Jack Bauer! Enjoying your 24 book. Very much. Helping with withdrawal.. Very, very intriguing, and I’m liking the pace of the story. Keep it up. Thank you so much for this Great book. 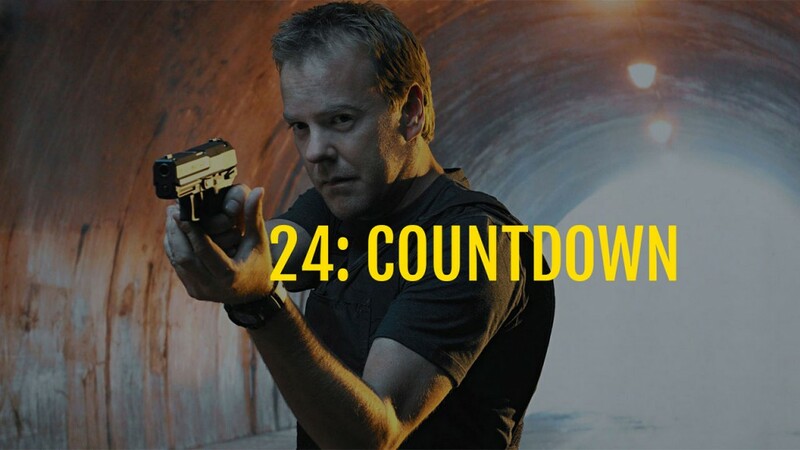 I have been missing some Jack Bauer in my life! The book is so exciting, it’s like having another day of 24!